LG has mostly moved to LED back lighting in their LCD televisions but there are still a few lines of CCFL (fluorescent) back lit LCD models like the CS560 series. The 37" 37CS560 has a 1080p, 60Hz LCD panel with flurescent back lighting but few other features. 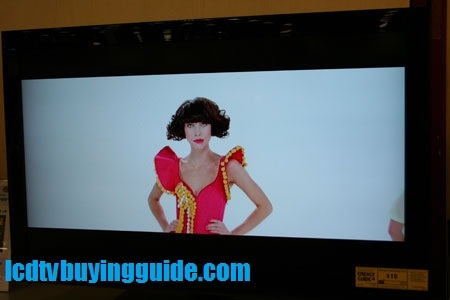 This shot of Kimbra Johnson known mononymously as Kimbra shows good lifelike flesh tones and hue on the LG 32CS560. LG's LCD televisions have had good picture quality for the last few years and it gets better with the 2012 models. The CS560 has good contrast and black levels and color quality is realistic for an LCD TV. You probably wouldn't expect a picture this good in a value priced model. One drawback: Edges are a little soft. Side angle viewing isn't a strong point in most LCD televisions but LG has outperformed the competition in this regard. The area in front of the screen where the picture retains it's full contrast and color is wider in the CS560 than in most of its competitors. With the 60Hz response rate of the this panel, you will of course notice some judder and this is not the best TV for fast motion. However, with HD movies the 1080p resolution looks very good. The LG 37CS560 is set up for easy calibration both from ISF, and with the Picture Wizard feature which allows you to easily calibrate the TV yourself. The tool has on-screen reference points for you to match up. The Intelligent sensor technology also focuses on viewing quality based on in-room light conditions. The TV backlighting can adjust automatically to reduce or enhance contrast. The feature causes some slight distraction for me, but it can be turned off as well. Appearance is mediocre with a “wider-than-I-like” frame width in gloss black. The included table top stand does not swivel. The remote control is simple, but backlit and has plenty of functionality. The menu is easy to understand and use – an excellent benefit to LG's LCD TVs. There are not many choices in the market for a 37” TV and in this size you dont need all the features either. At a price of around $449 this is not a bad value TV. It should give you long lasting, solid performance. Without Stand: 35.9" x 22.5" x 3.1"
With Stand: 35.9" x 25.2" x 10.4"